I knew I would love Chef Michael Cimarusti‘s cooking long before I set foot into Providence. His appearance on season two of After Hours with Daniel [Boulud] was brilliant. It’s rare that a guest chef outshines the legendary Boulud, but on this episode, Chef Cimarusti really did. His exuberant personality, refreshing levelheadedness, passion for ingredients, and commitment to sustainability was genuine and inspiring. Reading positive reviews can be persuasive, but actually witnessing the Chef in his element proved far more effective. Exciting things were happening inside Providence’s kitchen, and I wanted to experience them firsthand. With tasting menus starting at just under a hundred dollars, an evening at Providence is a special occasion splurge. The Astronomer’s 25th birthday, which serendipitously coincided with the restaurant’s 4th anniversary, provided the perfect opportunity to treat ourselves to a two-star Michelin feast. 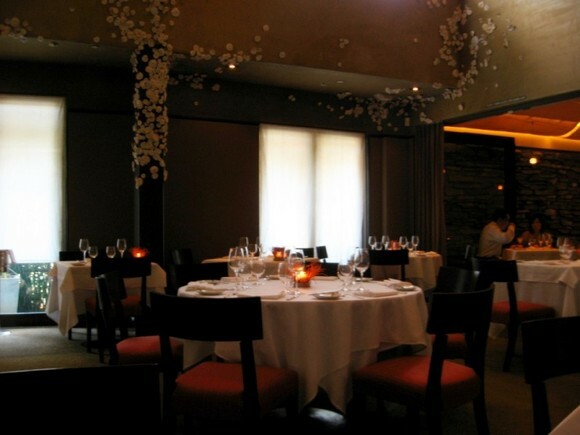 In celebration of their anniversary, Providence temporarily reduced the prices of their tasting menus to 2005 levels. The Astronomer and I opted for the Full Tasting ($95). We were presented with complimentary glasses of Nicolas Feuillatte Brut M.V. upon wishing Providence a very happy anniversary. It pays to Twitter. 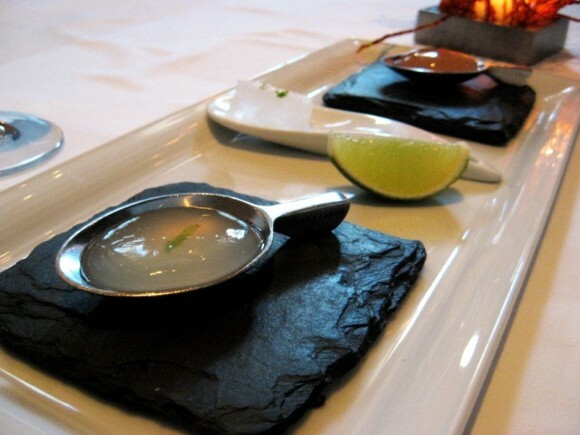 Our first amuse of the evening was a trio of “shots”—from left to right—mojito, gin and tonic, and greyhound. We were instructed to start with the gin and tonic, followed by the mojito, and finish with the greyhound. With a squeeze of lime, the jellied gin and tonic was a potent first shot. The mojito and greyhound were held together by the thinnest of membranes. One slip of the tongue and the cocktails burst in our mouths. Even though we’ve experienced liquefied orbs before, it was still a totally awesome sensation. 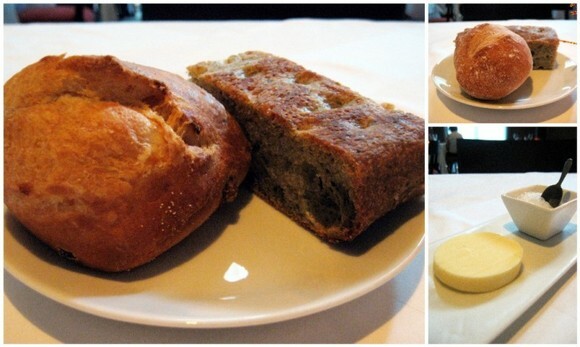 Following the three shots were a trio of breads—from left to right—bacon brioche, focaccia, and white. Cold unsalted butter with a dish of coarse sea salt was served on a chilled platter alongside. The bacon brioche, with its salty bacon bits and smoky aroma, was hands-down our favorite. We requested another to share. 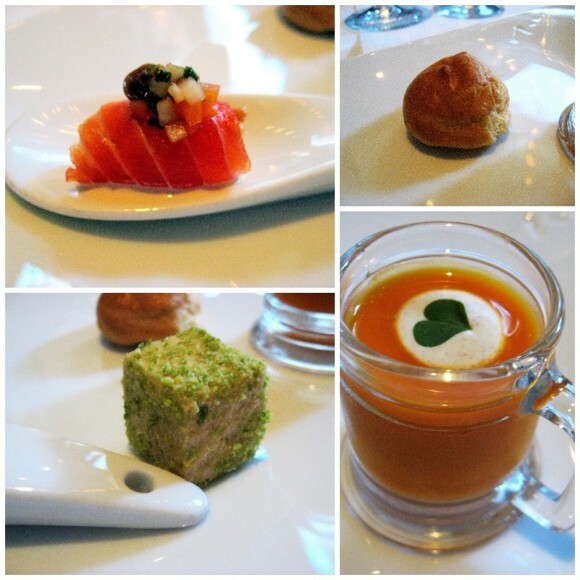 Our second amuse of the evening contained four very different elements—clockwise starting from top left—smoked trout, a gougère, carrot soup, and a wasabi pea encrusted soy marshmallow. We were instructed to eat from left to right, only one bite or gulp each. We began with a firm and fresh spoonful of smoked trout topped with a brunoise of pickled vegetables. Next, we moved on to the soy marshmallow. I was expecting a firm, tofu-like consistency as I plopped the cool cube into my mouth, but instead I experienced a most enjoyable mush, followed by the peas’ crunch and spice. Up third was a bite-sized gougère. Unlike the gougères I devoured at The French Laundry and Church & State, this one was piped with an oozy cheesy. The unexpectedly warm and saucy center was a welcomed contrast to the simplicity of the first two bites. Lastly, we took a big gulp of chilled carrot soup topped with a dollop of curry whipped cream. The soup was smooth, sweet, and good. 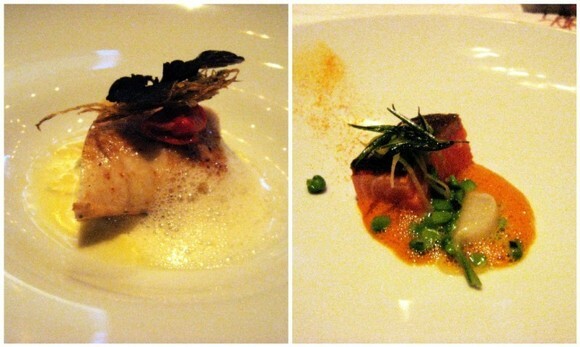 With their playful contrasts in temperatures, textures, and flavors, the series of amuses did their job spectacularly. We were ready to begin our tasting menu. 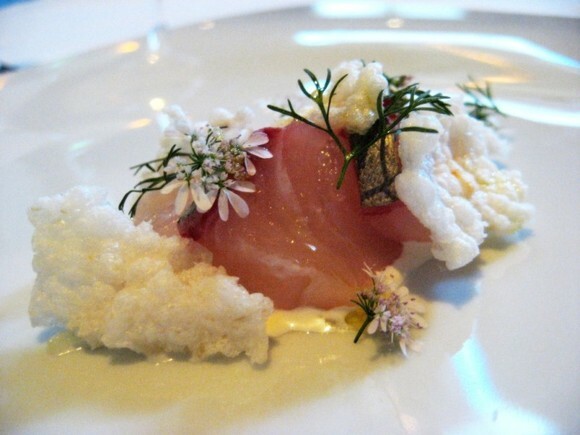 The first official course of the evening was Japanese kanpachi sashimi with crispy rice crackers and flowering coriander. Beneath the two slices of fish was a neat pool of soy crème fraîche and endives prepared sous vide. Chef Cimarusti has an affinity for layering flavors and textures upon one another, which makes each and every dish interesting from top to bottom. As our waiter listed off this dish’s components, I was a bit curious about the soy crème fraîche. Heeding my interest, our waiter went into the kitchen and brought out cubes of “soy salt” for me to smell and touch. Talk about going above and beyond the call of duty! It must be emphasized that Providence is staffed by an army of astute, friendly, well-dressed, and very accommodating waiters. Service throughout the entire evening was flawless. Course number two was Santa Barbara sea urchin served in a farm fresh egg. Sea urchin and I haven’t hit it off very well in the past, but at Providence, we became very good friends. The uni was served warm in a sea of Champagne beurre blanc and fines herbes. The undisturbed yolk at the bottom of the egg provided a rich finish. After seeing Chef Cimarusti prepare salt-roasted Santa Barbara spot prawns on After Hours with Daniel, I couldn’t leave Providence without having those little guys in my belly. I requested these prawns in place of the lone meat course on the tasting menu. They are priced at $33 on the a la carte menu. The prawns arrived on a rolling cart, drowning in a sea of 400 degree salt and rosemary sprigs. A kind French gentleman prepared the dish tableside, serving the prawns simply with French cold pressed olive oil and lemon wedges. The tails were tender and sweet, while the heads were juicy and succulent. The server was pleased to hear that I enjoyed the heads. He says that most people are grossed out by it. The fourth course of the evening was a perfectly seared Hokkaido sea scallop from Japan resting in a bath of Jurançon Sec. Fava beans, chanterelles and applewood smoked bacon rounded out the cast of flavors. 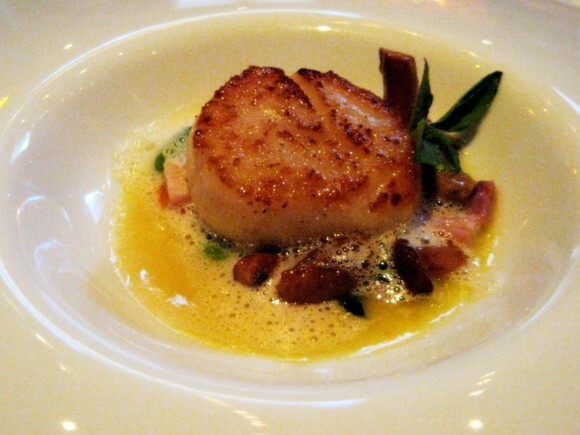 It’s not difficult to find a well-prepared scallop around town, but only the best seafood restaurants can offer a plump and sweet beast of this caliber. The fifth and sixth courses were both flawless fish preparations. The John Dory (left) arrived first. The menu had originally listed halibut, but by the time this course rolled around, John Dory was being used instead. I have developed an irrational obsession with John Dory thanks to Gordon Ramsay’s Hell’s Kitchen. Hearing Ramsay call out an order for “Dory” never fails to bring a smile to my face. Providence’s John Dory was sandwiched between burdock prepared two ways—fried up top and pickled on the bottom. The shiso and lemon were fine foils for the flaky white fish. Following the John Dory was Arctic char with Japanese turnips, sweet peas, preserved Meyer lemon, and gingered carrot juice. The vibrantly pink Arctic char was prepared rare and flaked off in tender sheets. Its crisped skin was equally fabulous. The Astronomer and I were both taken aback when the roasted tenderloin of veal arrived, since we had requested the spot prawns in its place. 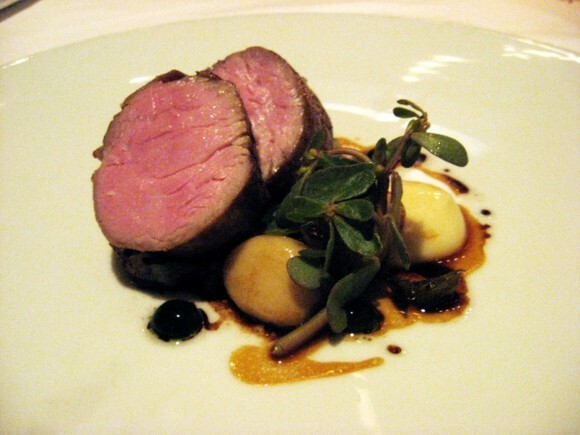 The two pink rounds of free-range veal were accompanied by crushed King Edward potatoes, spring onions, hazelnuts, and a spring garlic confit. Hunks of meat proved too much for me at this point, so The Astronomer stepped it up and consumed all four slabs of veal. The incredibly smooth potatoes were all mine. Since I was almost out of precious gastro-real estate after the veal, we decided to skip the cheese course and go straight for sorbet. 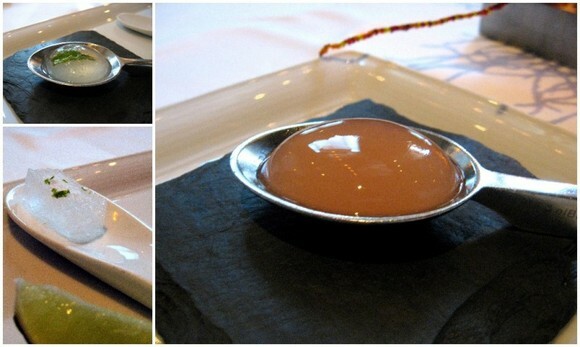 When sorbet courses are done right, they have a magical way of refreshing the palate and livening up the senses. This evening’s cucumber sorbet with kaffir lime, juniper berry, and yogurt (not pictured) was sublime. The julienne of cucumbers beneath the sorbet was a lovely touch, as was the essence of kaffir lime. 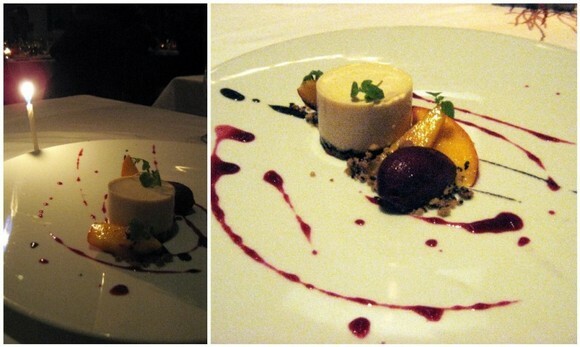 The last course was a miso cheesecake with black sesame crust, Masumoto peaches, and cassis sorbet. I loved that the cheesecake, with its silky consistency, leaned toward savory. The cassis sorbet, which tasted like a cross between raspberries and tamarind, was an out of sight pairing. I wish all desserts could be this bold and successful. And finally, a selection of mignardises—passion fruit and chocolate lollipop (left), hazelnut amaretto, vanilla jelly, lemon verbena salted caramel (right). Love the sea urchin in egg presentation! Haven’t been to Providence in a couple years, but need to get back soon! I love Providence. I’ve never had a bad meal there, and the tastings are amazing. 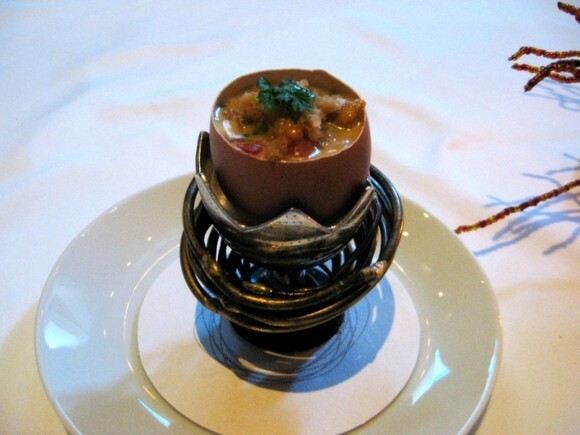 Also, the sea urchin in egg shell is one of my favorite dishes ever. 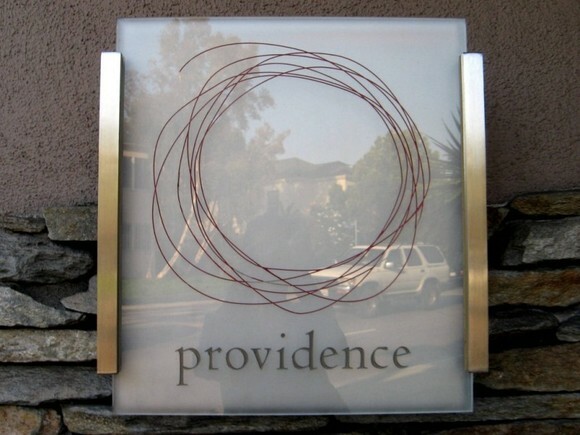 Did you know that I had my first Providence experience with HC of LA and OC Foodventures? 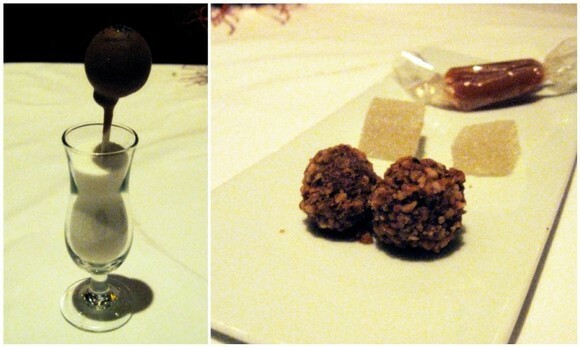 This post reminds me, I still need to go back for the Chef’s Menu, their 16-course extravaganza. This is just too beautiful. I can’t believe we hv the same cameras. Great post. 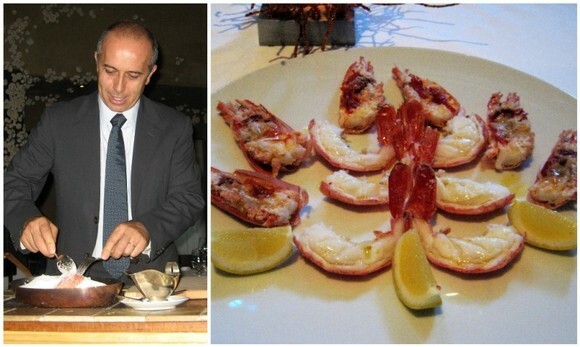 Jo – I can’t imagine going years without Chef Cimarusti’s cooking. Go! Now! Rivers – My money’s on Cimarusti! He’s just so smart and talented. You and Po are going to love Providence. Kevin – I’ve already asked Vernon to take me back to Providence for the Chef’s tasting on my birthday! Woo hoo! Sadly, I will have to wait until February of 2010 😉 You go first, k? You may be forgiven, however, due to your request for a second round of bacon brioche. happy belated bday! We’ve also seen a demonstration of those spotted prawns too…sounds like you guys had an amazing experience! Wow. Sounds amazing and I’m not even that big of a fish fan. I hear they have a dessert tasting, too. I’ve been wanting to check it out. Cathy — thanks for the write-up — it’s on the list for my birthday dinner. Time to get busy with some seafood!